Ayushman Bharat aims to provide health risk coverage through health insurance and improve access to primary healthcare through the health and wellness centres. 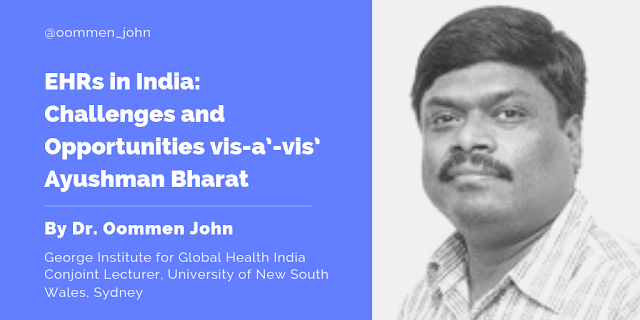 Healthcare delivery systems in India face challenges on multiple fronts, such as surging costs, inconsistent quality of care and opaque reporting of health outcomes. Appropriate use of digital health tools, Electronic Health Records (EHR) in particular as a system level intervention, can improve efficiency and effectiveness of healthcare delivery in the context of health systems strengthening. With the operationalisation of Ayushman Bharat and its scale up, the healthcare establishments across the country are being empanelled for provision of healthcare services under this scheme. However, in the absence of mandated reporting of clinical outcomes by the healthcare establishments, increasing number of people availing services in the current health delivery capacity (which is significantly limited) can adversely impact quality of healthcare being delivered. Inconsistent quality of care poses an immense challenge towards achieving the overall objectives of Ayushman Bharat. An Electronic Health Record (EHR) is an unique longitudinal electronic record of a person’s health over the life course that comprise of patient demographics, progress notes, clinical problems, medications, past medical history, laboratory data etc. and can be accessed instantly and securely by authorized users. An unique identifier for each person, provider and clinical establishment delivering the care is essential for EHR, so as to enable the sharing of records across different healthcare providers The purpose of collecting medical records, as outlined by the Ministry of Health in the EHR Standards notified in 2016, is improved care that is evidence based, accurate and faster diagnosis that translates into better treatment at lower cost of care, avoidance of repeating unnecessary investigations, robust analytics including predictive analytics to support personalised and contextualised care, improved health policy decisions based on better understanding of the underlying challenges, all translating into improved personal and public health outcomes. Despite broad consensus on the potential benefits of EHRs, the Indian healthcare establishments have been slow to adopt them. Research shows that EHR data provides valuable insights on the operational aspects of health insurance reimbursement models and informs policy directions on the payer – provider ecosystem. As Ayushman Bharat envisages to be implemented on a robust information technology backbone, it is an opportune time to explore and understand the status of implementation of EHRs in India. 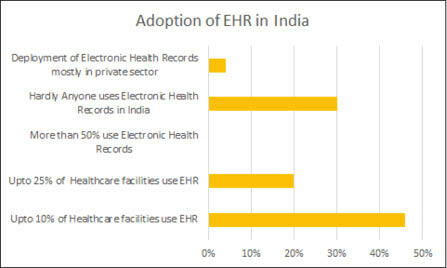 We conducted a study to understand the perception among key stake holders on the current status of EHR in India. This was an online survey, followed by key informant interviews aimed at identifying frequently reported barriers for the adoption of EHR in India and potential solutions for overcoming the same through policy interventions. A total of 50 key opinion leaders were contacted, 30 of them consented to participate. The informants comprised of CEOs of healthcare establishments, members of the working group of the 2016 EHR Standards for India, researchers in the area of digital health, industry representatives, experts from the Indian Association for Medical Informatics who have led and supervised EHR implementations in India and other countries. We also included a few medical students to gain the perspectives of the “digital native” generation who would be the key clinical decision makers in the near future. 1. How have Indian Healthcare establishments fared on the adoption of Electronic Health Records? 2. What value do you see in the role of Electronic Health Records in the context of Ayushman Bharat? .83% of the key opinion leaders endorsed that Electronic Health Records would enhance the health systems ability to collate data and draw inferences on disease burden and treatment practices in India through the adoption of EHR in the Ayushman Bharat programme. 77% of the respondents highlighted that use of EHR for the implementation of Ayushman Bharat can augment the clinical workflow, seamless referral between primary, secondary and tertiary care settings and implement standard treatment practices at the point of care and thereby addressing the variability of care quality. Transparent clinical documentation was recognized as third most important role of the EHR with 70% of them inferring that improving the transparency of clinical documentation would be a key factor for the success of the health insurance model of improving healthcare access. Less than 30% felt that EHRs will only help for billing purposes and insurance claims processing, indicating that some of the concerns and perceived challenges by healthcare establishments around the scope of electronic health records are unwarranted and there is perhaps a need for sensitization and awareness building for healthcare establishments towards the capabilities of EHR in the Indian healthcare delivery settings. 3. What are the Challenges faced by Indian healthcare establishments in the implementation of EHR? As the key aspect for success of electronic health records relies on the clinicians using the EHR for clinical documentation and decision making, acceptance by the clinicians was perceived as an important challenge. Patient loads in outpatient settings was reported as a key barrier to the use by the clinicians. Lack of a common understanding between the clinicians and the software development teams on the essential functionalities of EHRs often leads to overlooking the clinical components that would help in efficient and effective care delivery. Hospitals tend to focus primarily on the billing and revenue cycle management, and deploy technology solutions that address only this aspect, which is a huge disincentive for the clinicians. Loss of face to face interaction due to technology disrupting the clinician patient communication was seen as a major drawback of EHRs. Not engaging with the end users (including understanding the patients’ preferences) results in poorly designed EHRs. Most EHRs do not consider the patient behaviours into the design process, unlike in the past, many patients are technology savvy and maintain their treatment related records in electronic formats and on their mobile phones, there are no mechanisms in most EHRs to allow for patients to contribute these valuable clinical and treatment related information into the care delivery pathways. Health care in India is provided in a multi-lingual context however most EHRs do not have multi lingual capabilities. As healthcare in most settings is delivered through fragmented multi-specialist approach, the inability of the health record to follow the patient from one centre to another in electronic format impacts the delivery of comprehensive multi-disciplinary care and also results in unwarranted repetition of investigations thereby increasing the financial burden on the patient and the healthcare systems specially in the case of a reimbursement model. At the health system level, multiple parallel electronic formats of health data collection is undertaken across vertical programmes (TB, Vector borne diseases, NPCDCS etc) similar data being collected repetitively across these verticals. All these generate islands of valuable data that could inform decisions when consolidated into an common electronic data repository. There is a compelling need for better interoperability of these systems, and adhering to the EHR standards would be essential to make this happen. Finally Lack of any incentive for the clinicians for using EHR, the anticipated incentive being clinical value and improved care coordination. 1. Relative lack of computer literacy amongst healthcare professionals and EHRs lacking user centred design for ease of use. 2. Poor change management practices and communication silos within the healthcare delivery systems. 3. Lack of uniformity in EHR software despite the availability of EHR standards 2016 and an enabling environment created by the Government through the national EHR resource centre at CDAC, Pune. 4. Lack of synergy between healthcare providers resulting in non-interoperability. “Data hugging” by clinical establishments. 5. Lack of Operating System agnostic EHR and mobility extensions as apps. 6. Lack of awareness around privacy and health information security protocols. 7. No mandatory requirement to electronically monitor and report on clinical outcomes to a central nodal agency. As the EHR standards for India are available since 2016 and adequate time has been provided for the healthcare establishments and EHR providers for compliance, Ayushman Bharat is an opportunity to mandate the implementation of standards compliant EHR for accreditation of clinical establishments under Registry of Hospitals in Network of Insurance (ROHINI). This could be facilitated through the EHR certification process by National Resource Centre for EHR Standards in India, at C-DAC, Pune. Further creating an enabling environment by incentivization through a higher reimbursement provision for those using certified EHR and submitting clinical summaries in electronic formats for the claims processing under Ayushman Bharat. Creating awareness, with reference sets for clinical specialities, storage registries, data dictionaries and clinical terminologies, such as SNOMED CT (made available by the Government of India under a national license). Ayushman Bharat is also an opportunity for rethinking health systems in Indian context and build consensus towards a digitally enabled future ready health delivery system. All of this being mindful that digital health technologies are only enablers and health systems strengthening involves a broader approach as outlined by WHO Framework on integrated people-centred health services. A practical approach could be designing an integrated healthcare portal/software platform provided by the government for all stakeholders to “plug and play” where preventive health interventions, prescriptions, clinical procedures, lab reports etc. are updated at each encounter into an unique citizen health record. A model of an integrated platform was recently launched by the Ministry of Health and Family Welfare as Integrated Disease Surveillance Programme component incorporating the EHR standards (2016), this back bone could be leveraged to develop the above mentioned “plug and play” platform services. This could also make provision for APIs for mobility extensions to allow patients to update their own data from their mobile phones and data by frontline healthcare workers and thereby allowing clinicians to review patient generated, field collected information and support the delivery of comprehensive care. To improve usability, natural data input such as handwriting, voice could be considered in the EHR. An inter-exchange format for Indian standards and Indian language support could be built progressively. Sensitization of the workforce through training of doctors and nurses and making it incentive based and compulsory for career progression. The patients also should demand implementation of EHR and should be empowered with extension of a portable EHR (PHR) for their own use and portability. This might be a step towards putting the person at the centre of health delivery systems. 1. Sensitise healthcare workers on importance of EHR. 2. Introducing data science and health informatics as a part of curriculum in medical and allied health education. 3. Build synergy between healthcare professionals and software developers. A national repository of user centred EHR design elements and a national health data dictionary with common data models. 4. Utilize open source Operating Systems and tools for developing EHR. Open architecture for EHRs that allow API integration with point of care and IoT devices on a strong information security framework. 5. Use standard clinical workflow guidelines and including clinical workflow guidelines for developing EHR solutions. 6. EHRs to have functionality of directly porting data into clinical registries as well as outcome monitoring dashboards. The availability of large data sets in domains outside of healthcare combined with the rapid evolution of computational sciences offer promising opportunities for extracting new inferences and actionable insights that have the potential to radically improve health outcomes. However, health systems are yet to leverage these promising capabilities in data science, machine learning and artificial intelligence to discover novel approaches to healthcare delivery and improving outcomes. EHRs are routinely not available in many LMIC settings including India, and non availability of data is often seen as the constraint for proactive policy interventions. 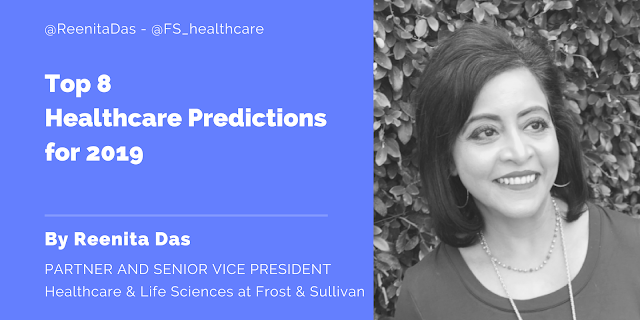 Valuable clinical information exists in compartments mostly outside the health systems and patient generated health data particularly from point of care diagnostics and IOT devices is growing at a tremendous pace. These are currently not used by the health delivery systems. An example being mobile phone and internet based messaging platforms, where a wealth of clinical information is exchanged. These unstructured datasets could be leveraged to build health data repositories while the EHRs are evolving and implemented in India. The citizen digital locker could be another potential resource for a citizen held personal health record or portable EHR. As Patient generated data are not linked into the healthcare providers clinical information workflows the benefits of these data sets are not being utilised. Futuristic health systems and EHRs should permit self-monitoring and point of care testing data that facilitates health analytics with predictive and prescriptive output finally leading to individual specific precision medicine under the supervision of the treating clinician. When functionality of the EHRs move into the hands of the end users, be it patients, their immediate care providers, the adoption and demand for the same would significantly increase. Improving the usability and user experience of EHRs such as incorporating voice based Inputs, hand writing inputs with Natural Language Processing and machine processing / learning techniques for clinical coding, contextually augmented Clinical Decision Support with automated patient notification to better manage care and follow up, with clear policy for patient data ownership would be a way forward to implement person centricity and prevent clinical establishments from continuing deliver opaque outcomes. A national policy around health data as a public good and a framework for government led initiatives for developing AI models for improving the health of the citizens would be important as EHR adoption improves. Data is an emerging currency equivalent, India has the potential of becoming the global capital of this ecosystem, health data perhaps holds the key and Ayushman Bharat is a valuable opportunity for building a future ready person centred health system that the rest of the world could emulate. In this journey, a national standardized EHR might be the first step.